If you’re interested in reading a scientists biography in a graphic novel format, then this might be a good choice, although it’s not exactly a biography as such – you just get scenes from Richard Feynman’s life, that you could also find in his stories, but here you get them in a shorter graphic format. If you already know who Richard Feynman was and have read books by/about him, then it might be a bit boring if you’ve read something just recently, but if it’s been a while since you’ve read about Feynman, then it’s a good reminder. I like the choice of scenes (There are the essential safe-cracking at Los Alamos, Arlene and Nobel prize etc), the art is nice too, I would have given it a higher rating if I wouldn’t have read so much about Feynman recently. 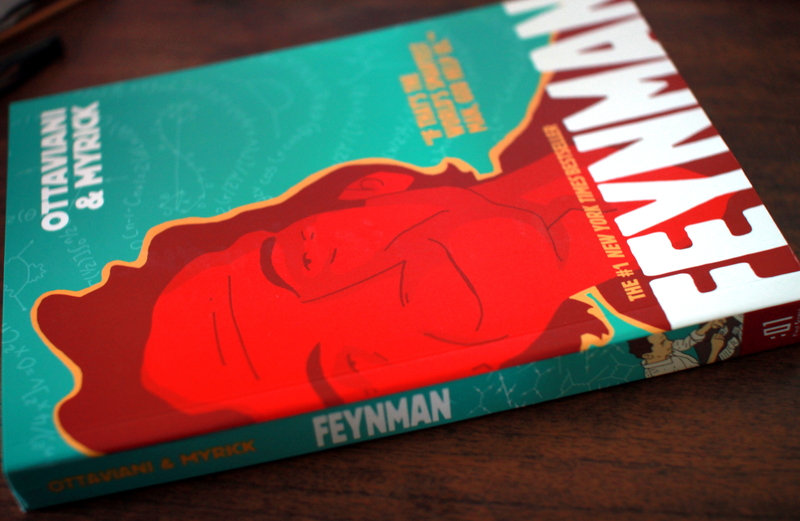 So in general, if you’ve no idea who Feynman is, pick this book up! It’s a quick read and fun. And it reads almost the same as Feynman stories do, but you get them in a concentrated form. This entry was posted in biography, Non-fiction and tagged book review, books, First Second books, graphic novel, Jim Ottaviani, Leland Myrick, Physicist, Richard Feynman. Bookmark the permalink.